I believe that God is holy no matter what name we use, hence the life he created is also holy. Surely there is more to life than the vicious cycle of work-produce-consume and watching TV sets in the evening inside living room, thinking the same thing doing the same thing even defecate the same thing. There is more to it, something pure and holy, creating the perfect balance of small universe once we pursue to it and look behind the stage of artificial worldly systems. Run to the back, turn around and see how funny the big fat hamster always running and running inside its yellow wheel, racing towards nothingness. Play by its rules but never let it traps you. Be free, run through the sunny field outside, jump from the cliff into the refreshing blue sea, be free. Last time I went to Labuanbajo at Flores island, a beautiful dry barren land in harmony with white sandy beach and clear ocean. It’s located east of the famous Bali island, usually people go there to see Komodo Dragon and to do diving between many small islands near it. It was my second day there, I was on a boat to nearby island to see the Komodo Dragon. I actually was on that boat on a mission: I wanted to find someone who was willing to go to Wae Rebo together with me, it was difficult to find someone to go there and share the expense as going alone hiring car by myself would be too expensive. 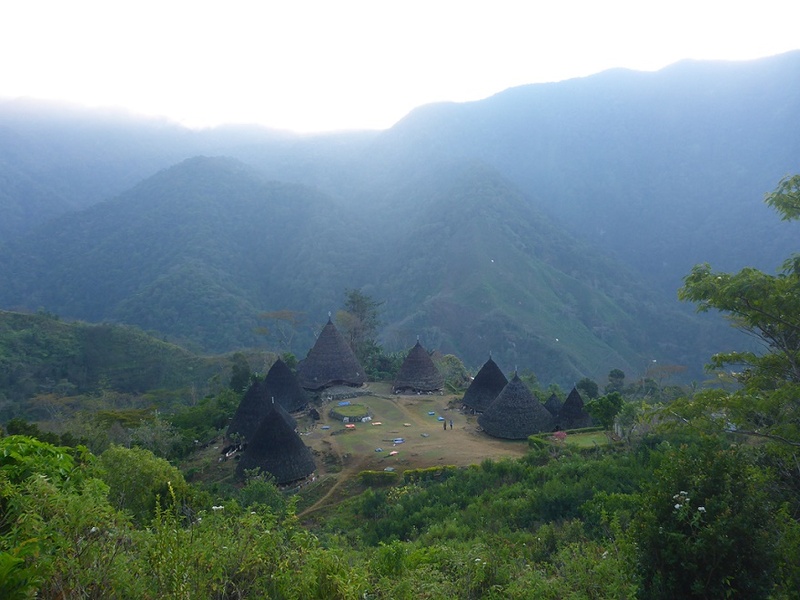 Wae Rebo is a traditional village of Manggarai tribe, with its uniquely cone shape of seven houses called Mbaru Niang and can be reached by driving seven hours from Labuanbajo and three hours of hiking. Thinking it now, maybe that’s why people rarely interested to go there. On that boat I met with an Indonesian guy who came from Bandung city in West Java, still young maybe around twenty six or seven but was cheerful and he greeted everyone there. I talked with him and was surprised to learn that he was one of the student that helped renovated one of Mbaru Niang in Wae Rebo few years ago. To do that he needed to stay at Wae Rebo with no access to phone and all necessity of the modern city life, and he fell in love with the village in the process. After that he keeps coming back to Wae Rebo, educating the people there how to correctly process the coffee beans to increase the quality to compete better in the market (almost everyone in Wae Rebo are coffee farmer). That way he encourages people in Wae Rebo to increase their life quality without relying too much on the eco-cultural tourism. We got along well as my interest to him grew, and had fun that day seeing the Komodo Dragon and island-hopping and snorkeling. The day after, I finally on my way to Wae Rebo as the night before when I was back again to Labuanbajo, I met a girl from Argentina that also wanted to go to Wae Rebo. After the long driving we finally arrived to a village named Denge, a starting point before we started hiking. The trek was fine but heavy thick mist came down the mountain so the atmosphere became quiet and mystical. After three hours we finally made it to Wae Rebo before dark, and we were directed to the inside of the main house for the elderly in Wae Rebo to had a welcome ceremony by a very old lady there, who basically was praying in Manggarai language and asking permission to their ancestors of Wae Rebo that this foreign people came to their land and become the children of Wae Rebo, therefore asking them to protect and keep away from any harm. After that we were free to stroll around the village where I had the opportunity to talk with the people there. I was surprised that when I mention the name of the guy from Bandung that helped them renovate the house, they were all suddenly had the same shimmering bright smile on their face, and they told stories about him as if he was one of their own, a family or a long lost dearest brother. It was clear to me that this guy made such a positive impact to this village and its people, it was great to see the positive vibe spreading away like ripple on a calm lake, all it need was just a drop of pebble. I usually met these kind of people when I travel, and that was also one of the reason I like travelling alone. It was a remembrance and also a refreshment to myself to see such soul living the real life and not dictated by money, money, goods, luxury and all conveniences and elegance of life but to let the passion and love to drive and fuel all the actions and decisions. Maybe not necessarily that only traveler posses such quality because I believe such passion is liquid and have many forms and thoughts, the kind of people who know what they want and takes control of life, not letting them became the victim of the system but instead using it to achieve their passion.